Build collaborative meeting agendas in Slack with our simple, easy-to-use SlackBot. Click here to install the SlackBot. Follow the bot’s prompts to set up your SoapBox and create your first meeting. Set up a meeting by typing “meet with” and then the @mention of the person you want to meet with. Add agenda items to the meeting by typing “add to” and then the @mention of the person you’re meeting with. Then, type the agenda item. To see your meetings, type “show people” – click on a person’s name to see your agenda item and even update the meeting time! There's so much to ❤️ about the SoapBox SlackBot! Build agendas naturally by adding items when they pop into your head. The bot prompts managers and employees to add items to the agenda beforehand. Sync meetings with your calendar to keep your schedule up to date. See full agendas ahead of time – right in Slack – to prepare for your meetings. You invite them to a meeting, we’ll show them how to add agenda items. Our web app has more goodies to help you get more out of your meetings. The SoapBot SlackBot gives you a 👍 when it adds items to the agenda. Meeting reminders get sent out the day before, so your team isn’t caught off-guard. "I've moved all my 1:1s and team meetings to SoapBox since I started using it, and I LOVE having everything in the one place!" 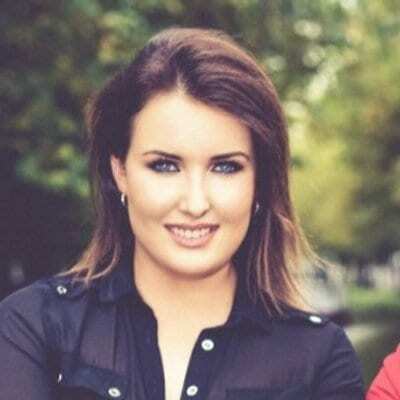 "As a manager, having my one-on-ones in SoapBox has been the biggest boon to my workflow that I’ve ever experienced." "I like that you prompt me and especially employees to add agenda items. I'm getting more agenda items from employees than I did before using SoapBox, and I'm getting items that I wouldn't have expected to get." "The Suggested Questions prompt some good conversations." "We have so many things going on all the time and lots of problems to solve so it’s easy to get distracted. SoapBox has given direction to our meetings." Need some help? This should get you back on track. You're on the right page! 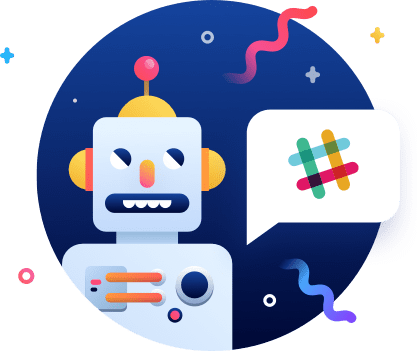 Click that “Add to Slack” button, then follow the prompting messages which will take you to the Slack App where you should have some Direct Messages from @soapboxbot. Is SoapBox going to spam my team on Slack once I install it? Nope! SoapBox will only interact with the people you tell it to. To set up a one-on-one, simply say "meet with @person" in a direct message to @soapboxbot and then the bot will reach out to that person. 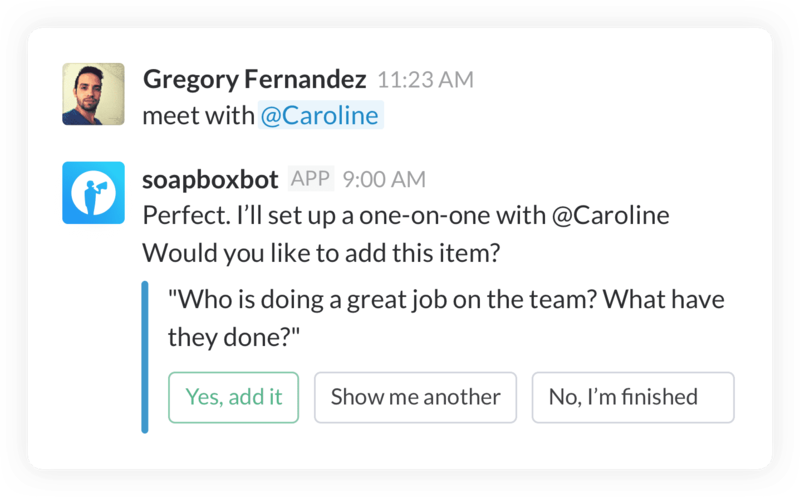 Or, to set up a team meeting, invite @soapboxbot to a team channel in Slack by saying "/invite @soapboxbot". It's free to use! Our one ask is that you give us as much feedback as possible, so we can continue to shape this product into something you want to use every day. Apparently I can't add bots to my Slack team. What do I do? Some companies lock down their Slack communities and must manually approve adding an app to it. We've made a page to specifically help you get SoapBox approved – check it out here! We ❤️ feedback! 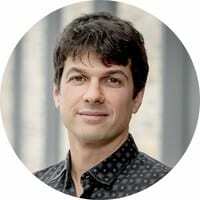 We want to build a product that fits seamlessly into your daily life, a life where it becomes easier to give and receive feedback than not do anything at all. Help us build that tool for you by emailing us your feedback to help@soapboxhq.com. I have more questions! How do I ask them? We ❤️ questions, too! Email us at help@soapboxhq.com and we’ll get back to you ASAP.